This article is about the Futurama character. For the actress, see Pamela Anderson. Pamela Anderson is an famous actress from the 20th Century. She assisted Walt, Larry and Igner in discovering Fry's pin number, enabling Mom to steal his fortune. Later she was kidnapped and held at Kidnappster so illegal copies of her could be made. Pamela apparently won an Oscar for Baywatch: The Movie, the first film to be shot entirely in slow motion. She lent her voice for Dixie who appeared as Slurms MacKenzie's babes in "Fry and the Slurm Factory". 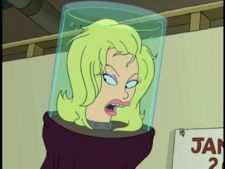 Pamela Anderson: Hello, Fry. Remember me from Baywatch: The Movie? Pamela Anderson: [whispering] Then he doesn't know I won the Oscar? This page was last edited on 30 May 2017, at 08:45.